July | 2013 | It's a Miracle! I have long held the opinion that if translation is difficult, translating Rabindranath Tagore’s poems and songs from the original Bangla into English is nearly impossible. Part of the difficulty is inherent in the language and cannot be circumvented easily by any translator: for example, Bangla, like many other Indic languages has three forms of “you” (aapni, tumi, tui) complete with complementary verbs, but no pronoun or verb form that distinguishes between the male and female “him” or “her”. Not only does Tagore revel in using this ambiguity in Bangla, but the musicality of his rhyming verse and the cultural connotations of the words he uses do not translate well at all. So, while I appreciate the efforts of the likes of Ketaki Kushari Dyson and William Radice in making him accessible to a wider audience, knowing Bangla myself, like millions of others, I take refuge in the original works. I’ve particularly been frustrated by Tagore’s own recreations of his work, which can frankly, only nominally be referred to as translations. Any writer is entitled to recreate his work in any manner he chooses, but as readers enthralled by his mastery in his native language, likewise, we are well within our rights to fret when the essential beauty is not fully transferred. Of course, this frustration is entirely subjective. In the vast body of early translations of Tagore’s work from the 1900s, all of which I might add, are no longer under copyright or redistribution restrictions, there are certain stories, poems, and passages that still enthrall, even after translation. One small aspect of Tagore’s vastly, brilliant oeuvre relates to his understanding of, and love for the emotions of children. These stand out in numerous works even in translation, and I’ve selected a few that include the language of children. 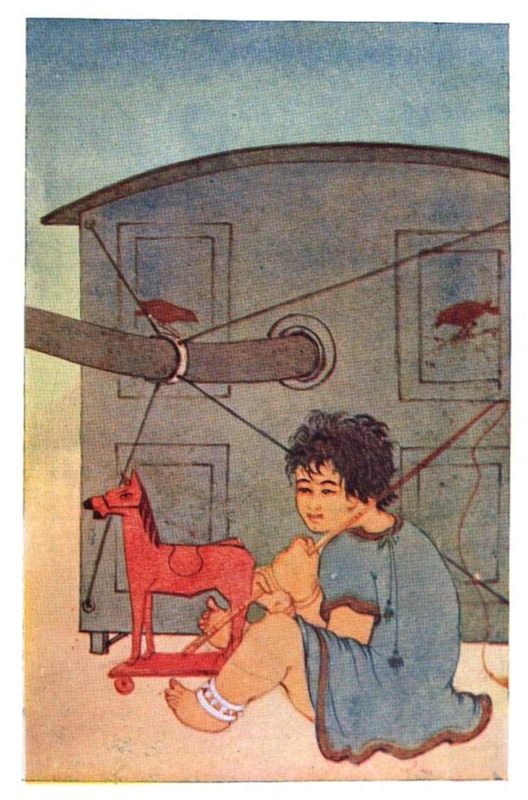 The excerpts here are prose-poems from The Crescent Moon (1913) recreated by the poet himself; the short-story “Kabuliwala” in The Hungry Stones and Other Stories (1916) translated by C.F. Andrews; the short-story, “The Postmaster” in Mashi and Other Stories (1918, translator uncredited); and the short-play, The Post-Office (1918), translated by Devabrata Mukherjee. All of the links are to the free, full-text of the books and all excerpts below are unedited with the exception of the excerpt from The Post-Office which needed to be cleaned up and modernized a bit. Kabuliwala has been made into two films- in Bengali by Tapan Sinha (1957) and in Hindi by Hemen Gupta (1961). The Postmaster is one of three short films that form Satyajit Ray’s Teen Kanya (1961). Mother, if you don’t mind, I should like to become the boatman of the ferry when I am grown up. It is evening and the sun goes down. The waste of Joradighi; lies wan and grey before us. The land is desolate and barren. Supposing I became a champa flower, just for fun, and grew on a branch high up that tree, and shook in the wind with laughter and danced upon the newly budded leaves, would you know me, mother? You would call, “Baby, where are you?” and I should laugh to myself and keep quite quiet. I should slyly open my petals and watch you at your work. When after your bath, with wet hair spread on your shoulders, you walked through the shadow of the champa tree to the little court where you say your prayers, you would notice the scent of the flower, but not know that it came from me. When after the midday meal you sat at the window reading Ramayana, and the tree’s shadow fell over your hair and your lap, I should fling my wee little shadow on to the page of your book, just where you were reading. But would you guess that it was the tiny shadow of your little child? When in the evening you went to the cow-shed with the lighted lamp in your hand, I should suddenly drop on to the earth again and be your own baby once more, and beg you to tell me a story. “I won’t tell you, mother.” That’s what you and I would say then. One morning, however, not many days later, as I was leaving the house, I was startled to find Mini, seated on a bench near the door, laughing and talking, with the great Kabuliwala at her feet. In all her life, it appeared; my small daughter had never found so patient a listener, save her father. And already the corner of her little sari was stuffed with almonds and raisins, the gift of her visitor, “Why did you give her those?” I said, and taking out an eight-anna bit, I handed it to him. The man accepted the money without demur, and slipped it into his pocket. “The Kabuliwala gave it me,” said Mini cheerfully. I, entering at the moment, saved Mini from impending disaster, and proceeded to make my own inquiries. It was not the first or second time, I found, that the two had met. The Kabuliwala had overcome the child’s first terror by a judicious bribery of nuts and almonds, and the two were now great friends. And he would reply, in the nasal accent of many a mountaineer: “An elephant!” Not much cause for merriment, perhaps; but how they both enjoyed the witticism! And for me, this child’s talk with a grown-up man had always in it something strangely fascinating. It seemed as though the showers of the season would never end. Canals, ditches, and hollows were all overflowing with water. Day and night the patter of rain was heard, and the croaking of frogs. The village roads became impassable, and marketing had to be done in punts. It was some time before the postmaster, with weakened body, was able to leave his sick-bed. ‘No more of this,’ said he with decision. ‘I must get a transfer.’ He at once wrote off to Calcutta an application for a transfer, on the ground of the unhealthiness of the place. The postmaster laughed. ‘What an idea!’ said he; but he did not think it necessary to explain to the girl wherein lay the absurdity. On getting up in the morning, the postmaster found his bath ready. He had stuck to his Calcutta habit of bathing in water drawn and kept in pitchers, instead of taking a plunge in the river as was the custom of the village. For some reason or other, the girl could not ask him about the time of his departure, so she had fetched the water from the river long before sunrise, that it should be ready as early as he might want it. After the bath came a call for Ratan. She entered noiselessly, and looked silently into her master’s face for orders. The master said: ‘You need not be anxious about my going away, Ratan; I shall tell my successor to look after you.’ These words were kindly meant, no doubt: but inscrutable are the ways of a woman’s heart! The new incumbent duly arrived, and the postmaster, having given over charge, prepared to depart. Just before starting he called Ratan, and said: ‘Here is something for you; I hope it will keep you for some little time.’ He brought out from his pocket the whole of his month’s salary, retaining only a trifle for his travelling expenses. Then Ratan fell at his feet and cried: ‘Oh, Dada, I pray you, don’t give me anything, don’t in any way trouble about me,’ and then she ran away out of sight. Dairyman: Curds, curds, good nice curds. Amal: Curdseller, I say, Curdseller. Dairyman: Why do you call me? Will you buy some curds? Amal: How can I buy from you? I have no money. Dairyman. What a boy! Why call out then? Ugh! What a waste of time. Amal: I would go with you if I could. Amal: Yes, I seem to feel homesick when I hear you call from far down the road. Dairyman: [Lowering his yoke-pole] What are you doing here, my child? Amal: The doctor says I can’t go out, so I sit here all day long. Dairyman: My poor child, whatever has happened to you? Amal: I don’t know. You see I am not learned, so I don’t know what the matter with me is. Say, Dairyman, where do you come from? Amal. Your village? Is it far away? Dairyman: Our village lies on the river Shamli at the foot of the Panchmura hills. Amal: Panchmura hills! Shamli river! I wonder. I may have seen your village. I can’t think when though! Dairyman: Have you seen it? Been to the foot of those hills? Amal: Never. But I seem to remember having seen it. Your village is under some very old big trees, just by the side of the red road, isn’t it? Dairyman: That’s right, my child. Amal: And on the slope of the hill, cattle graze? Dairyman: How wonderful! Are there cattle grazing in our village? Indeed, there are. Amal: And your women with red sarees, fill their pitchers from the river and carry them on their heads? Dairyman: Indeed, that’s right. Women from our dairy village do come and draw their water from the river; but then it isn’t everyone who has a red saree to put on. But, my dear child, surely you must have been there for a walk some time? Amal: Really, I have never been there at all. But the first day the doctor lets me go out, will you take me to your village? Dairyman: I will, my child, with pleasure. Amal: And you’ll teach me to cry ‘curds’ and shoulder the yoke like you and walk the long, long road? Dairyman: My oh my, but why dear? Why should you sell curds? No, you will read big books and be learned. Amal: No, I never want to be learned – I’ll be like you and take my curds from the village by the red road near the old banyan tree, and I will hawk it from cottage to cottage. Oh, how you shout–“Curds, curds, good curds!” Teach me the tune, will you? Dairyman: My dear, teach you the tune? What an idea! Amal: Please do. I love to hear it. I can’t tell you how strange I feel when I hear you cry out from the bend of that road, through the line of those trees. Do you know I feel like that when I hear the shrill cry of birds from almost the end of the sky? Dairyman: Dear child, will you have some curds? Yes, please have some. Amal: But I have no money. Dairyman: No, no, no, don’t talk of money! You’ll make me happy if you have some curds from me. Amal: Say, have I kept you here too long? Pity poor Allen Webb, stationed in Calcutta in 1848, after two major pandemics had wiped out hundreds of thousands of people, having to draft his textbook- the monstrously named Pathologica Indica; Or, The Anatomy of Indian Diseases: Based Upon Morbid Specimens, from All Parts of the Indian Empire, in the Museum of the Calcutta Medical College, Illustrated by Detailed Cases, with the Prescriptions and Treatment Employed. And so it was, back then, before Pasteur and Koch: the causative agent of cholera and typhus and plague and quite literally malaria was “bad air”. And if you’re curious, one of the recommended methods of treatment of cholera in Webb’s textbook was the administration of chloroform. The patient literally passed out and was “cured” of the malady. 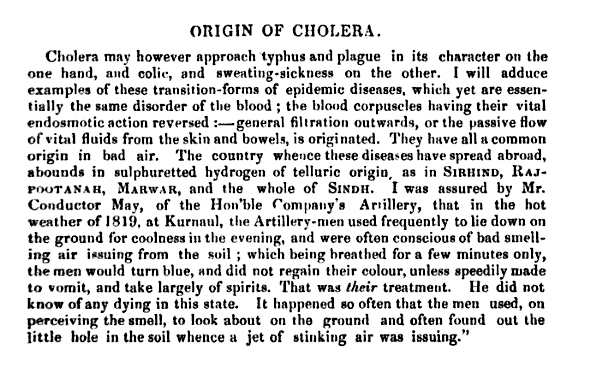 Cholera has made a fool out of more than one scientific soul. On October 7, 1892, a contemporary of Koch, Max von Pettenkofer swallowed one cubic centimeter of bullion laced with the infectious cholera microbes derived from a patient who had died from it. 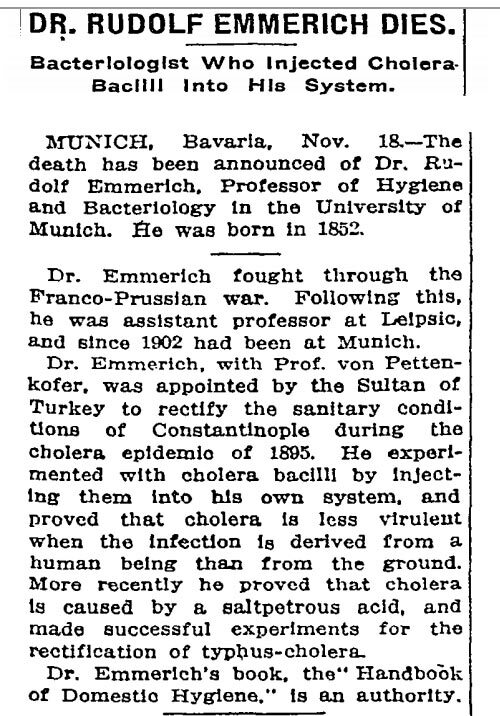 After suffering from intense abdominal pain and diarrhea for nearly a week, he declared when he did not die that the microbe alone was insufficient to cause cholera. Two other famous scientists, Elie Metchnikoff (who would later win a Nobel Prize for immunology work) and Rudolph Emmerich, self-administered infusions and came to the same erroneous conclusion. Those were most certainly different times. Nowadays, I’m not sure that modern Institutional Review Boards would allow these types of experiments on human subjects. That said, self-administering has a long history in microbiology. Do failed relationships reach a point when they snap? Or is the end gradual, like the loss of magnetism of two bodies that do not attract or even repel each other, but simply exist in a shared space? What remains when a relationship ends? Once it is all over, is it possible to ever truly forget what existed? These are difficult questions to which there are only tantalizing possibilities and not any concrete answers. But we can start to ponder on a rainy evening in the waiting room of railway station in a small town by the name of Rajpur. Rajpur was like thousands of other mofussil towns, fortuitously near rail lines, but where no one would ever think of disembarking unless they had some definite purpose. As might be expected, due to the lack of passengers under normal circumstances, the waiting room of the railway station was seldom used. But, as the lone woman sitting in a corner of the waiting room on that rainy night was about to discover, it was not a normal night and these were not normal circumstances. Like the train that had brought a woman to this small town, another one had cut through the rain and had stopped at a desolate platform with just enough time to allow a man to disembark from it. The man had no intention of stopping at Rajpur railway station, but as often happens due to some mishap, he was now resigned to the fact that he too would have to spend a few hours inside the waiting room while he waited for the next train. When the man, Satadal, entered the waiting room of the railway station he froze. The woman he was now forced to share a waiting room with was Madhuri, who had been his wife for seven years. After those momentous years, Satadal and Madhuri had divorced and gone their separate ways for five years without ever keeping in touch with each other. How would they react to their forced presence in the waiting room? How would they bear each other’s presence and ultimately reintroduce themselves? This waiting room closeted physically by rain is the setting of the masterful short story, Jatugriha (“Lac house”) written by Bengali author, Subhodh Ghosh. In this short story, Ghosh poses questions on a failed marriage and its aftermath and offers open-ended possibilities. The title, Jatugriha, refers to an episode in the Mahabharata in which the righteous Pandavas are tricked into staying in a house made of lac and other flammable materials by their perennial foes, the Kauravas and their allies. Alerted by their uncle, Vidura, the Pandavas escape, while the house burns to the ground. Subodh Ghosh wrote the story over fifty years ago, in what was, in my view, the Golden Age of the Bengali Short Story. This was the post-Tagore era when masters like Bibhutibhusan Banerjee, Tarasankar Banerjee, Narayan Ganguly, Samaresh Basu, Saradindu Banerjee, Premendra Mitra, and Ashapurna Debi were breaking free from the well-crafted idealistic template created by Rabindranath Tagore, and experimenting with form, style, and modern language. Among these stellar writers, personally, I would rate Subodh Ghosh and Premendra Mitra worthy of being mentioned in the same breath as greats of the short-form in other languages like Chekhov, Borges and Anderson. Ghosh had a checkered life from which he drew a seemingly infinite set of interesting stories. In the preface of a slim volume of collected works, he wrote that he drew upon his experiences as a circus-performer, bus conductor, hotel-manager, mica-mining prospector, confectioner, butter merchant, sadhu, political worker, district-board health-inspector, poultry farmer, and union volunteer, before settling on the relatively relaxed life of assistant editor of Anandabazar Patrika. Both Mitra and Ghosh are perhaps best known outside Bengal through cinematic works; Mitra’s stories formed the core of Satyajit Ray’s Mahanagar and Kapurush and an episode in Gulzar’s Khushboo, while Ghosh is credited with Bimal Roy’s Sujata, Ritwik Ghatak’s Ajantrik, Basu Chatterjee’s Chitchor and Tarun Majumdar’s Thagini. The short-story Jatugriha is the subject of at least two movies, for which Subodh Ghosh received credit, the Tapan Sinha-directed Bengali classic Jatugriha (1964), starring Uttam Kumar and Sinha’s wife, Arundhati Debi in the leading roles; and the Gulzar-directed Hindi art-house movie, Ijaazat (1987), starring Naseeruddin Shah and Rekha in the primary roles of Mahinder and Sudha (and there is also a third character Maya, played by Anuradha Patel, in a role unique to this version). This was the Rajpur Railway Station, not a court. Here there were no judges, no lawyers, no witnesses, no lines formed by unblinking, judgmental eyes. There were no devious lines of inquiry by an appointed third party simply because there were no secrets to be unearthed. Still, the secluded familiarity of being together in the same waiting room was suffocating. It would have been nice to have escaped: it would have been proper to have escaped. The earliest cinematic interpretation of the story is Tapan Sinha’s black-and-white Jatugriha, produced by Uttam Kumar. This version employs a linear narrative in which the back-story dealing with the actual divorce is the subject of most of the movie, leaving the chance encounter at the railway station for the last twenty minutes. The movie is quite ambitious in scope, weaving together many different characters, allusions, and sub-plots that feed into the central examination of why Satadal and Madhuri, portrayed, respectively by Uttam Kumar and Arundhati (and I will refer to these characters in the movie by the actor to avoid confusion with the short-story) were unable to salvage their marriage. Sinha introduces us to two other original families along the way to underscore the unfolding tragedy. A loveless, yet well-to-do couple, perpetually quarrels in front of their child and others puts the audience in an uneasy situation with the pained poignancy of Francois Truffaut’s Les quatre cents coups; and an idealistic subordinate of Uttam Kumar has a growing family, but is extremely poor and cannot afford their upkeep. Trapped between these two families are Uttam Kumar and Arundhati, who never openly express their hostility in the way of the former, but can also not communicate their love freely like the latter either. A world of possibilities, now meaningless. The movie explores the taboo subject of infertility in quite a bit of detail, as well as its impact on the marriage. The problem explicitly stated through the movie, which forces the couple to get divorced is that Arundhati is incapable of having children and that Uttam Kumar is incapable of accepting this as reality. Unwilling to see their relationship end bitterly, Arundhati offers Uttam Kumar “release” from their marriage. She leaves him and a life of luxury to take up work as a teacher in a village school. Uttam Kumar finds out that his victory is hollow: he falls into a self-destructive spiral, fixating on the family of his subordinate who has children, and at one point offering them the dream-house he has been building for years. The subordinate refuses to take the house and Uttam Kumar’s defeat is complete: he realizes that he has absolutely nothing to offer, not to himself, not to anyone else. Thus the stage is set for the encounter years later. Gulzar’s Ijaazat is unlike Sinha’s Jatugriha in that the substantial back-story, in this case, a love-triangle, is told primarily through flashbacks. In this story Mahinder (the Satadal character, played effortlessly by Naseeruddin) meets Sudha (the Madhuri character, portrayed with uncanny restraint by Rekha) at the railway waiting room. Given the requirements of the narrative, there is quite a deal more exposition between these two characters in Gulzar’s version than in the other two stories. There is also a third completely unique character, Maya (Anuradha Patel, in the role of a lifetime) madly and inexplicably in love with Mahinder, but too much of a free-spirit to give in to conventional expectations of love, marriage, and family. At the outset, Mahinder comes clean with Sudha telling her about his infatuation with Maya, but she decides to marry him anyway, partly because she was already betrothed to him, and partly out of gratitude to Mahinder’s grandfather who helped her family. During their marriage, Sudha plays the role of a dutiful wife, but her marriage with Mahinder implodes as he is forced to rescue Maya from her destructive tendencies at every turn. As the story unfolds, a set of ill-timed, perfect (almost too perfect) series of tragedies befall Mahinder and Sudha by way of Maya, impacting the marriage. And then, Sudha decides to “free” Mahinder. How the marriage is officially terminated is not spelled out in detail, but how Mahinder finds himself to be alone when he meets Sudha again five years later is. Ijaazat is a thoughtful, visually-expressive movie, filled with numerous scenes and conversations of immense beauty. The movie also has four of the most lyrically-expansive songs in all of Hindi filmdom, penned by Gulzar himself, composed by the inimitable R.D. Burman, and sung with grace and feeling by Asha Bhosle. The movie also succeeds in pulling off a remarkable feat: Maya, is not the subject of revulsion, like the “other woman” character in Hindi movies generally is, but an object of pity as a perpetual child-like woman who hurtles toward an inevitable, tragic end. Maya’s demise, though expected, is unfulfilling and deprives the movie of an additional layer of wonder and magic realism. Perhaps, she could’ve just disappeared leaving the audience wondering if she ever existed? The waiting room is a burning house of lac. Of the three versions of the story, fifteen years ago, I would have articulated most passionately in favor of Ijaazat. The reason I enjoyed Ijaazat so much when I first saw it in India (apart from the exquisite songs and the imagery) is obvious to me today. At the core, Ijaazat is most certainly male fantasy. A rather plain-looking man with middling qualities has two very beautiful, graceful women vying for his attention! Ijaazat is also a story that reinforces patriarchal stereotypes that are deeply engrained in South Asian societies. The preconceived assumption reinforced throughout the movie is that Sudha will be available should Mahinder decide to return to her. No matter what his moral lapses are, no matter that he is clearly still in love with his paramour, Sudha will take him back. 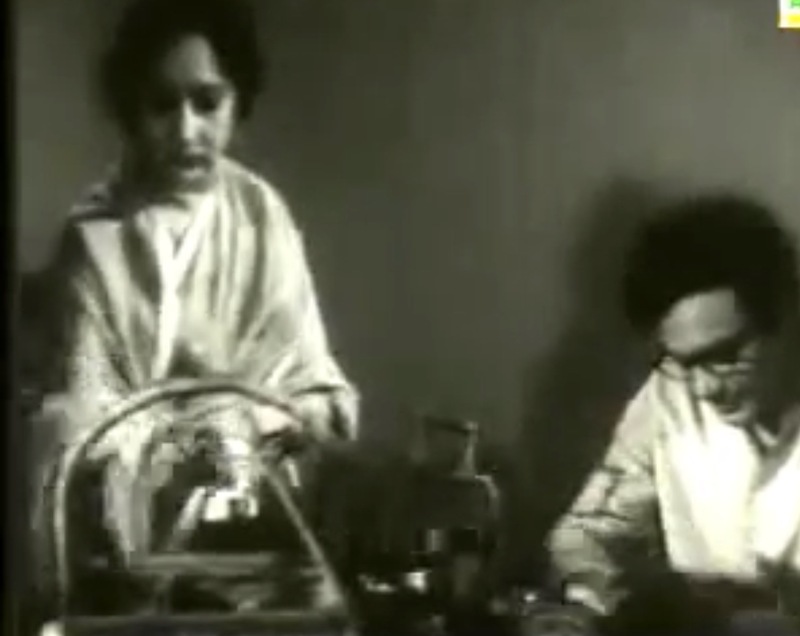 Even though a twist in the story, unique to Gulzar’s version disallows this possibility, the movie requires this artifact to reinforce the male ego and fantasy: the ijaazat (permission) that Sudha needs to take is from Mahinder: having committed no transgression throughout their relationship, she is required to touch his feet and asks for permission to move on with her life. I don’t know if I am more enlightened than I was decades ago, but even though I still enjoy Ijaazat immensely, I find reinforcement of this gender asymmetry disheartening. Sinha’s Jatugriha also reinforces male patriarchy too, but there is some semblance of balance: it is Arundhati Debi, who cannot conceive and who must go away to free Uttam Kumar, though this fact is well established early on after their marriage (and I wonder how the audience would have reacted if their matinee idol, instead was infertile). But, at least here there is no acquiescence: even though it is glaringly obvious that Arundhati still loves Uttam Kumar when they meet five years later inside the waiting room, she does not make herself available despite their being no legal or moral impediments: she does not return to him. After all, as she points out in the ending seconds of the movie, the same physical and emotional barriers that caused their separation five years ago remain. In her mind, there is no turning back the clock. And while this is not the convenient answer that would’ve satisfied audiences longing for a reunion, it is the realistic one. Uttam: (Opening tiffin carrier) Have you eaten anything? Won’t you eat? Arundhati: I don’t eat anything bought outside. Uttam: Oh yes. I had forgotten…. [Turns around] Waiter? Arundhati: What will the waiter do? Uttam: I forgot to bring water. Arundhati: I will give it to you. [Walking up and pouring water into a glass]. What’s this? You bought food from the bazaar? You always used to get sick eating food from the bazaar… Should I see what is available? Arundhati: [Returning minutes later] I asked for two eggs to be poached. I have some buttered bread which you can eat… We are meeting again after seven years, isn’t it? Arundhati: You’ve become thinner. You also look very tired. Uttam: It is not a short amount of time. Seven years. And I’m getting old. Arundhati: What is your age you have to call yourself old? Uttam: That I don’t know. I always feel exhausted. You still look the same. Uttam: I’m hungry. You’ll have to give me a few more slices. Arundhati: I only brought four slices. If I knew I would be meeting you again, I’d bring more. This is an exceptionally trivial conversation, but this is exactly how a husband and a wife who are in love talk to each other. While this interaction was occurring, I found myself frozen in my seat: hidden inside these trite words of poached eggs and toasted bread were various permutations and combinations of hurt- there was a world of lost possibilities. We stood with Mahinder as Sudha took permission to leave. We watched Uttam and Arundhati share intimate, fleeting moments together. It is perhaps fitting that we now return to the waiting room, one last time to meet the original Satadal and Madhuri- the characters in Subodh Ghosh’s short story. It was yet another Sunday. Madhuri got dressed for their evening sojourn together, like any other Sunday. In another room, Satadal paid no heed to this ritual: he continued to sketch a building resembling a Chalukya temple. Not for a moment did it occur to him to stop and think that it was Sunday evening- the time when they always went for a walk. Madhuri did not disturb him. She sat next to the window, with her eyes fixed on the evening sky. She thought about the ephemeral red tinge and the billowing clouds that would soon pass beyond her view, and about the sheer pointlessness of it all. It would soon turn dark everywhere. Why the cruel charade? Why could the sun not set instantaneously? One by one, a parade of ill omens made it clear to Madhuri and Satadal that their love had evaporated. Or maybe there never was any love to begin with, and that was why the signs were visible? Who knew the truth? If they had made an effort, maybe they would have been able to find out. Maybe they did make an effort and they did find out. Maybe they didn’t. In the midst of this knowing and not-knowing, one thing was clear in their minds: they would not be able to blame one another. It is possible that they both knew why and kept quiet. It is also possible that neither of them made any effort to find out the reason. Ghosh also makes it amply clear that the possibilities for reunification are limited. Both Satadal and Madhuri in his story are now married to other people. There is no turning back. As the time for the trains to arrive and take Satadal and Madhuri approaches, Ghosh heightens the tension. In a moment of supreme weakness accentuated by the isolation of the surroundings, Satadal grasps Madhuri’s hand. With his voice quivering he blurts out, “I have not forgotten you. I could not.” He needs to say it like a drowning man needs oxygenated air. Men are hardly perceptive of subtle signs, but with the uncanny intuition than women possess in matters of the heart, Madhuri remains unmoved: the sudden pronouncement is superfluous to her. Of course, she knows. He does not, and the question begins to burn within him. Satadal needed to know. Was the sky that rose for seven years completely fictitious? Was it possible to forget everything? Will Madhuri not offer an answer to his question? What is love, even dying love, even love fizzing with the with last remaining embers, if it does not cruelly exact pain from the object of affection– an acid tear, a pound of flesh nearest to the heart? Madhuri does not need words, but Satadal needed to hear it from her. Did she forget him? He must know. Did she still love him? Did she still think of him? The time was short. This was, after all, a waiting room. The urgency was palpable. There was no escape from the lac house. In the hands of a lesser writer, the pendulum would have shifted back to predictable melodrama. The reader expects the only answer that is right: after all, marriage is a bond forged across seven lifetimes. Subodh Ghosh shows remarkable restraint and does not offer easy payout. Madhuri does not answer, but rather asks that she be given an opportunity when she can exploit his vulnerability and ask a similar question. She is his equal, after all. With lack of resolution, the tension escapes like air leaking from a balloon. The trains have now arrived. We, the readers, must also take leave. The Rajpur Railway Station waiting room has served its purpose. The story closes focusing on the one physical reminder of the encounter. The train to Kolkata had arrived at the platform on the other side. There were two trains now on either side, headed in opposite directions. There were no witnesses to the exchange of history of the two passengers who briefly cohabitated the waiting room. But if you looked closely, there was still one piece of evidence. 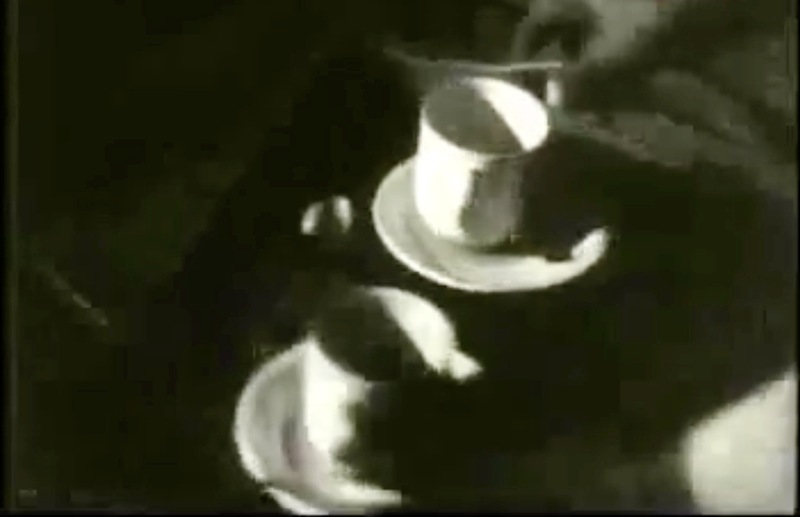 Inside the waiting room, on a table was a tray with two cups. Two people came from two different corners, briefly sat here, and quenched their thirst with tea. Before Rajpur Railway Station retreats into slumber again, someone will enter the waiting room to remove those two cups, wash them, and place them in the station pantry- one cup on one end of a cupboard and another, perhaps, on the other.